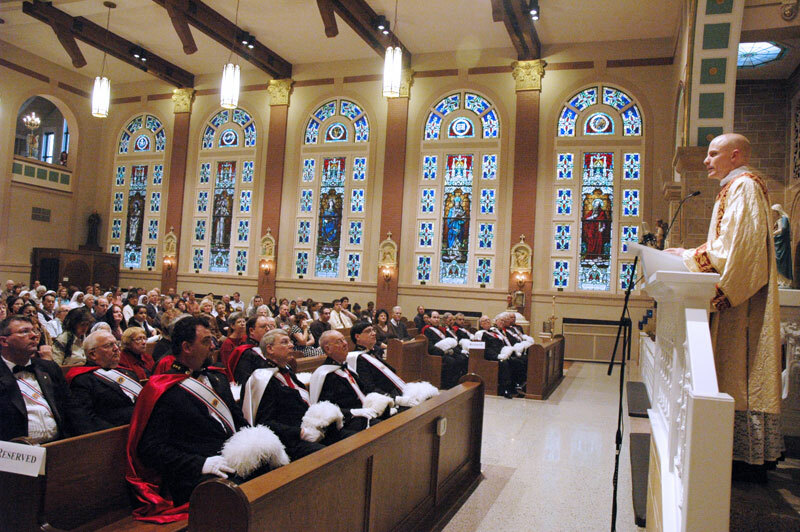 Father John Hollowell was ordained a priest on June 6, 2009, just prior to the start of the Year for Priests. He reflected on his joyful experience as a newly ordained priest in a series of reflections given during an annual 40 Hours devotion on March 8-10 at Our Lady of the Most Holy Rosary Church in Indianapolis. The last of his reflections was given as part of Holy Rosary’s 10th annual “Spaghetti and Spirituality” Lenten adult education series. Father Hollowell began by focusing on the joy he has found by deliberately planning for the near and long-term future, which he described as intentionality. He then encouraged his listeners to not wait for “the right time” to start giving attention to their lives of faith. A timely joy he reflected on was the practice of fasting, which Father Hollowell said he dreaded while growing up. “My least favorite was a tie between Ash Wednesday and Good Friday,” Father Hollowell said. The priest talked about how his spiritual director encouraged him, shortly after he was ordained, to fast on a regular basis. He said it has made a fruitful cycle in his life. He also encouraged his listeners to consider taking up the practice of regular fasting. Another joy for Father Hollowell is the happiness he sees in Catholics who love the Church and embrace its teachings. Father Hollowell claimed that this stance was rooted in schools of philosophy that emerged about 500 years ago in which people were encouraged to doubt everything. Such a position, however, he said, ultimately brings people to unhappiness and despair. “I think that what we see now, when we honestly survey the surroundings, that when people carry that out to its logical conclusion, there is no fruit on the tree,” Father Hollowell said. Father Hollowell said that the best way to make a connection with people who doubt the Church—and the vision for life that it offers—is to be joyful in our love of the faith and our example in living the faith. One of the people listening to Father Hollowell was someone who hears him preach on a regular basis—Peggy Martin, a member of St. Malachy Parish in Brownsburg, where Father Hollowell is in residence and serves as a sacramental minister. “He is a joyful person,” said Martin, who assists in her parish’s confirmation program. “He lives his faith. And you see it when he talks to us and he tells us his stories about his youth and how he got to be a priest. Prior to his 40 Hours reflection, Father Hollowell assisted Father Michael Magiera, Holy Rosary’s associate pastor, in a solemn high celebration of the extraordinary form of the Mass. Also assisting was Father Ryan Hilderbrand, a priest of the Evansville Diocese. Following the Mass, the Blessed Sacrament was exposed in a monstrance during Father Hollowell’s reflection.